Jack Canfield is a master motivator, world-renowned teacher, and bestselling author of The Success Principles. In his latest book, Success Affirmations, he helps readers break through to new levels of passion, purpose, and prosperity with 52 affirmations and time-tested wisdom. In our 24/7 world, where we move at warp speed, sometimes we let life happen to us instead of taking control of our direction. Other times, we suffer from information overload, and we fail to consciously control our positive thoughts, and we allow negativity to take over. For those who want to rise above, to get unstuck, or to catapult to a new level success, Jack Canfield will show you how positive affirmations can transform your life in extraordinary ways. Be careful what you wish for. You've probably heard that phrase often. But did you know there's actual science behind that advice? Researchers in the field of neuroscience now know that the brain is a goal-seeking organism. Whatever idea, image, or outcome you think about, talk about, and feel strongly about, you will bring about. Of course, far from being a dark and gloomy prospect, this powerful scientific phenomenon actually has the ability to improve every area of your life—in ways you can't even imagine today. There's even a tool you can use to focus your thoughts and accelerate the process of achieving your goals. It's called an affirmation: a statement that describes a goal as if it's already been achieved. What does an affirmation look like? I'm blissfully watching the sunset from the veranda of my estate in Tuscany is one example. I'm joyfully depositing a $100,000 royalty check from my bestselling book is another. They're statements that stretch your mind with new thoughts and lavish images—and actually work with the brain's own processes to bring about change in your life. When you bombard your brain with colorful pictures, exciting details, and joyful emotions of what will be, a phenomenon called cognitive dissonance occurs in your mind. Cognitive dissonance is the mental discomfort—the uncomfortable feelings—you get when you hold two conflicting beliefs or ideas: (1) your life as you're living it today and (2) your life as you would like it to be in the future. When you continue the limiting behaviors that got you to where you are today or believe strongly that somehow you're not capable of getting what you want—then you suddenly begin using daily affirmations to visualize a better life—you create a form of mental tension that your brain will do everything in its power to resolve by actually creating the better, more desirable lifestyle for you! Psychologist Leon Festinger, author of A Theory of Cognitive Dissonance, compares this process to how your brain reacts when you're hungry: It sends signals to your body to eat. In other words, it causes you to take necessary steps to resolve your hunger. In the same way, when you begin using affirmations to visualize your exciting new future with compelling pictures and emotions, your brain will likewise cause you to take those steps necessary to bring about that exciting new future. Bombarding your brain with thoughts of a better life through daily visualization and verbalization will actually force your brain to resolve the cognitive dissonance it dislikes. Affirmations are those highly visual and emotionally compelling statements you can use daily to visualize a better life. Everything great that has ever happened to humanity . . .has begun as a single thought in someone's mind. Since you're reading this book, you've probably decided you want your life to be different in some way. Whether it's a more exciting career, better finances, loving and supportive relationships, world travel, more vibrant health, or just the luxury of a calm and organized life that works for you, there are steps you can take toward getting there. This book is about those steps. Not only does it include recommended affirmations to get you started on this powerful daily habit, it introduces you to a set of 52 powerful principles that the world's top achievers have used for decades to excel in business, the arts, sports, philanthropy, politics, and more. These are principles that I have studied, taught, and applied to my own life for nearly 40 years—and that Ram Ganglani has used for three decades to achieve success in business, philanthropy, and private life. We've also seen these principles work in hundreds of thousands of lives besides our own. Using the framework of these proven principles, Success Affirmations is therefore not just a book of good ideas and positive thoughts, it's also a book of proven steps for creating success and happiness. In fact, if you mastered just one principle a week, as this book will guide you to do, you could literally transform your life in just one year. But the key is that you must take responsibility for implementing these principles in your life. Creating a daily habit of reciting and internalizing your affirmations is just one of these principles—which you'll find on page 45 entitled 'Week 10: Use Affirmations to Release the Brakes.' But make no mistake: you alone have to do the work of implementing these principles in your life—you can't delegate them or skip over the ones you don't like. In fact, each one is integral to achieving overall success. It's just like writing a book. Before you can even start the process, you have to learn to read and write, you have to learn structure and syntax, you have to learn to put words into a sentence and sentences into paragraphs and paragraphs into chapters. If you leave a step out, the book will make no sense and readers will not benefit from it. Imagine a book with no periods or commas, no paragraphs or chapters! It just doesn't work. Whether you're exercising, setting goals, meditating, studying, or even sleeping, some things you just have to do for yourself to get any benefit from them. And like the principles I teach in this book and the affirmations you will use to instill those principles and their benefits in your consciousness, if you'll simply make a commitment to applying them week after week and stick with it, you'll reap extraordinary rewards. Albert Einstein once said, 'The world as we have created it is a process of our thinking. It cannot be changed without changing our thinking.' Affirmations are the tool that, day by day, will slowly change your thinking. Make even greater effort by implementing these principles in your life, and things will begin to happen that you never thought possible. It happened for me—and this is Jack talking. Growing up in Wheeling, West Virginia, I lived in an average home. My dad was a workaholic and my mom, an alcoholic. I earned cash during summers working in my grandfather's florist business and as a lifeguard at the local pool. I made it through Harvard University on a partial scholarship—serving breakfast at the campus dining commons to pay for books, clothes, and dates. During my last year of graduate school, I got a part-time teaching job that paid $120 every two weeks. That had to cover my rent and other expenses. To say that I was often broke would be an understatement. When money was tight, I survived on what I called my '21¢ dinners'—a can of tomato paste, garlic salt, water, and a box of spaghetti noodles. ©2017 Jack Canfield. All rights reserved. 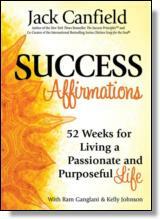 Reprinted from Success Affirmations: 52 Weeks for Living a Passionate and Purposeful Life. No part of this publication may be reproduced, stored in a retrieval system or transmitted in any form or by any means, without the written permission of the publisher. Publisher: Health Communications, Inc., 3201 SW 15th Street, Deerfield Beach, FL 33442. Jack Canfield is an award-winning speaker and an internationally recognized leader in personal development and peak performance strategies. As the co-creator of the Chicken Soup for the Soul® series, he's taught millions of individuals his formulas for success. He is the author and co-author of more than 150 books (including 66 bestsellers) with more than 100 million copies in print in 47 languages around the world. His bestselling book, The Success Principles has been hailed as the new self-improvement classic. Kelly Johnson has worked in the publishing industry for many years reading, selling, and marketing other people's books. She is the coauthor of Feeling Great: Creating a Life of Optimism, Enthusiasm, and Contentment with Peter Vegso and Dadi Janki. She lives near the sea in Satellite Beach, Florida, writing and doing the work she loves. Ram Ganglani is an entrepreneur, businessman, and mentor. Dedicated and positive, hands-on and strategic, Ram's career spans sales, marketing, and communications, from Africa to Europe, from the Middle East to Near Asia.